February 15, 2017 7:00 AM / 2 Comments on Davis or Fryden? The John Buslee crew’s original bombardier was Marvin Fryden. Fryden was killed on his second mission on August 5, 1944 by a burst of flak aboard Tremblin’ Gremlin. James Davis replaced Fryden as the Buslee crew’s bombardier. In the original Buslee crew photo that I have, the man standing on the far right is identified as James Davis. I have always questioned the accuracy of that identification. I have always believed that the bombardier in the photo is Fryden. On my visit to the National Personnel Records Center in St. Louis last October, I found a picture of James Buford Davis in uniform. I feel more certain now that the photo of the Buslee crew actually includes Marvin Fryden rather than Davis. James Davis on the left. Davis or Marvin Fryden on the right? Agree or disagree? I would love some feedback. 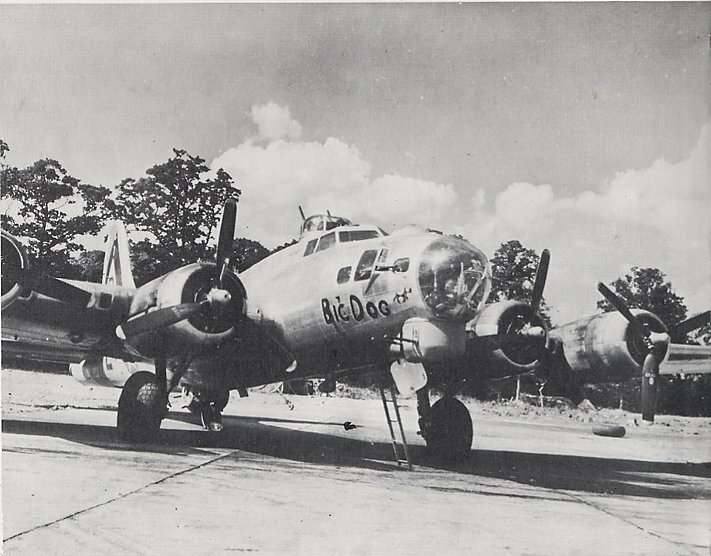 I previously wrote about James B. Davis, the second bombardier of the John Oliver Buslee crew of the 544th Bomb Squad of the 384th Bomb Group stationed at Grafton Underwood Airfield in England. Click here for the previous article. I have found some more information about him before and after his WWII years that I’d like to share. 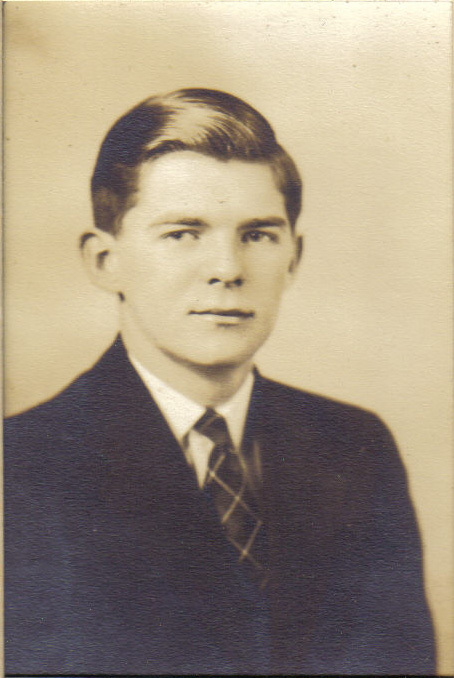 James Buford Davis was born on October 5, 1921 in New Castle, Henry County, Indiana to Charles Raymond (1891 – 1986) and Bessie “Bess” Millican (1893 – 1981) Davis. Charles Raymond, who went by the name “Ray,” named his son after his own father. He and Bess lived in Crofton, Christian County, Kentucky in 1920 and he was a farmer. But by the time son James was born, the family had moved to Indiana. In 1930, the Davis family lived at 356 South 14th Street in the Fifth Ward of New Castle, Henry County, Indiana. Ray was thirty-nine years old and Bess was thirty-six. Ray had been born in Kentucky and both of his parents were from Kentucky. Bess was born in Indiana. Her father was from Indiana and her mother was from Kentucky. James was eight years old at the time of the 1930 census. He had a younger brother Charles R., age five, and a younger sister Evelyn Joy, age four. Ray was employed as a commercial paint salesman. In 1940, the family had moved to 1216 Woodlawn Drive, but still lived in New Castle. Ray was still working as a salesman for a paint company. James was now eighteen years old, and had another brother Neel D. Davis, who was nine. The code of the sixty Hi-Y boys of New Castle High School was “clean speech, clean living, and clean scholarship.” All boys of good character who desired membership were eligible to join. 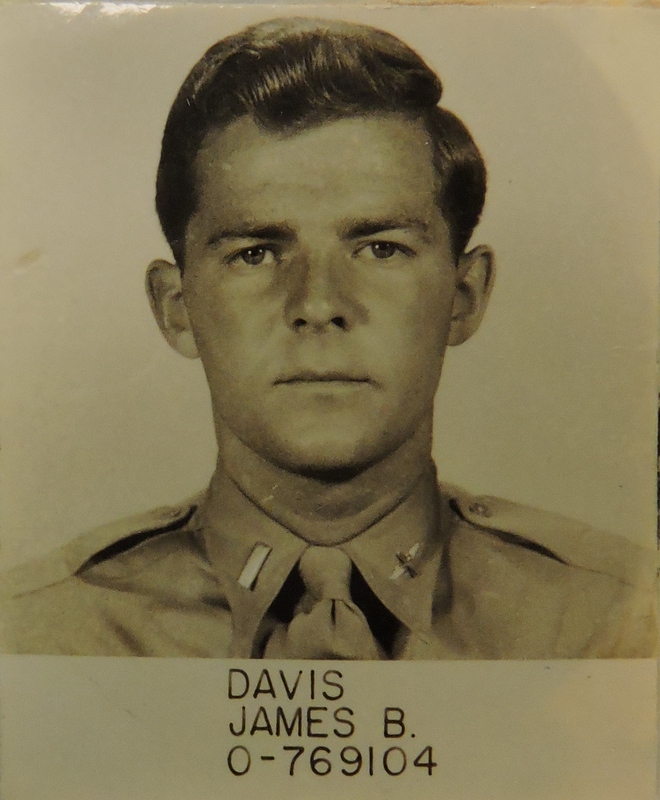 After high school, James attended college for two years before enlisting in the Air Corps on July 21, 1942 at Bowman Field, Louisville, Kentucky. As I’ve covered James’s WWII career here, I won’t cover it again. 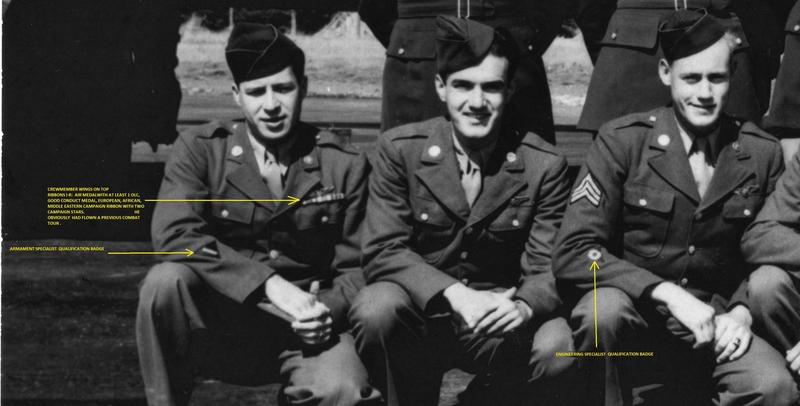 While serving with the 384th Bomb Group, James received 3 bronze stars, an Air medal with 5 oak leaf clusters, and a presidential citation. After the war, James graduated from Purdue University. He married Joan McShirley on August 21, 1948. They had one son, Sean (1951 – 1967). At one time James owned Express Auto Supply in Hobart, Indiana and later co-owned a Kentucky Fried Chicken franchise in New Castle, Indiana. James B. Davis, 88 of Indianapolis died December 20, 2009. Note: Now that I have found a photo of James B. Davis, I am trying to determine if the bombardier in the Buslee crew photo is the original bombardier Marvin Fryden or replacement bombardier James B. Davis. What do you think? Is the man standing on the far right Fryden (who I don’t have a picture of) or Davis? James Davis was not an original member of the John Oliver Buslee crew. However, his first mission as a bombardier was with the Buslee crew on the August 9, 1944 Mission 176 to the Erding Airdrome & Airfield at Erding, Germany. 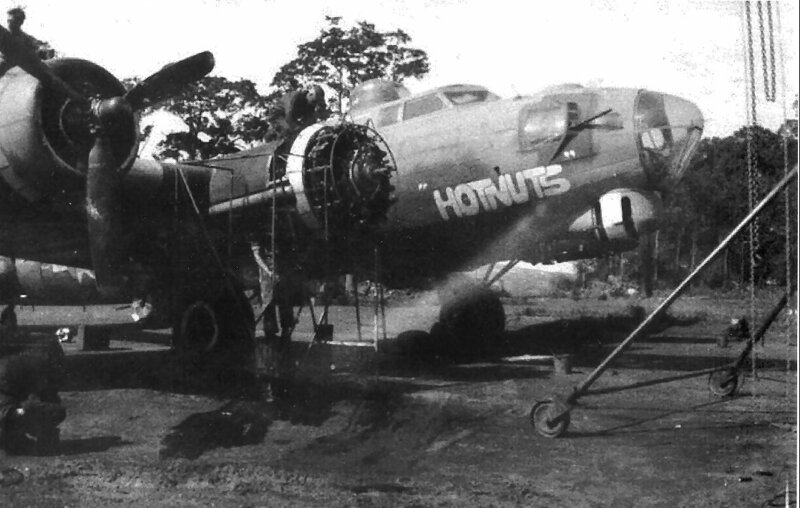 The 384th Bombardment Group (H) provided all three groups of the 41st “B” Combat Bombardment Wing – except for three aircraft from the 303rd BG, which formed the high element of the high group. 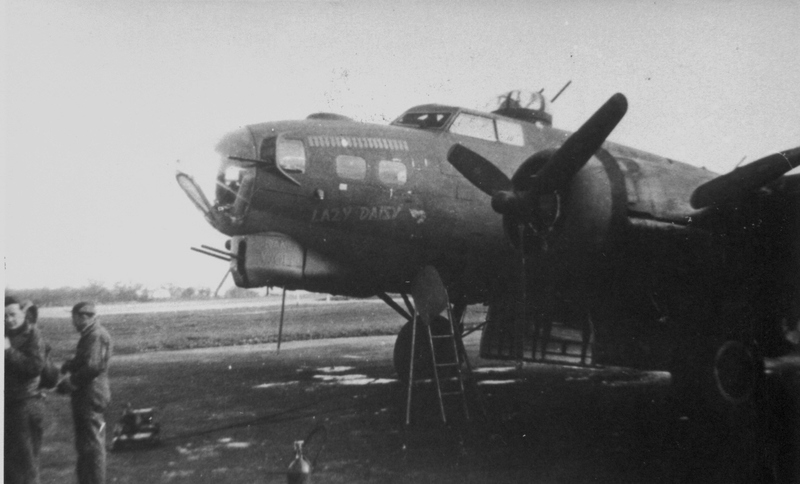 Although the division abandoned operations at the Dutch Coast due to bad weather, the 41st “B” carried on until after they had passed Aachen, at which point the weather had become impenetrable. The wing leader ordered the wing to attack the briefed target of last resort, which the lead and high groups accomplished. However, the low group’s bombsight gyro “tumbled” just before bombs away, so they went on to bomb a target of opportunity (TOO). The Buslee crew was part of the low group and their visual target of opportunity was a railroad and highway viaduct in Nohfelden/Hoppstädten, Germany. 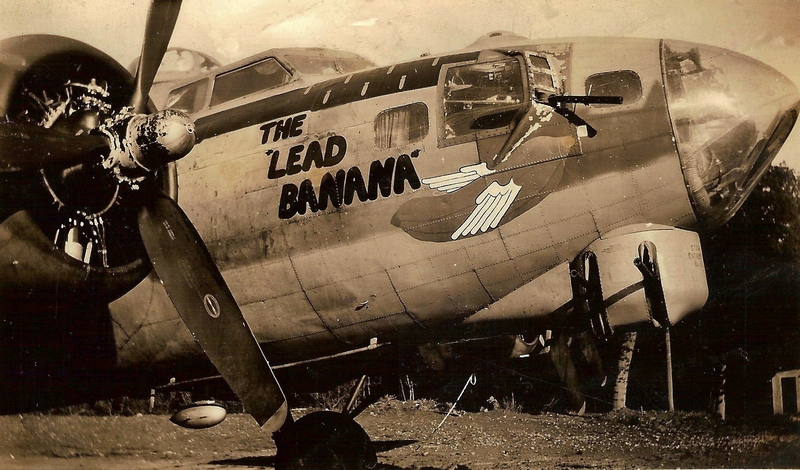 This must have been quite a harrowing mission for rookie bombardier, James Davis, but he went on to complete thirty-four missions before finishing his tour and returning to the states. 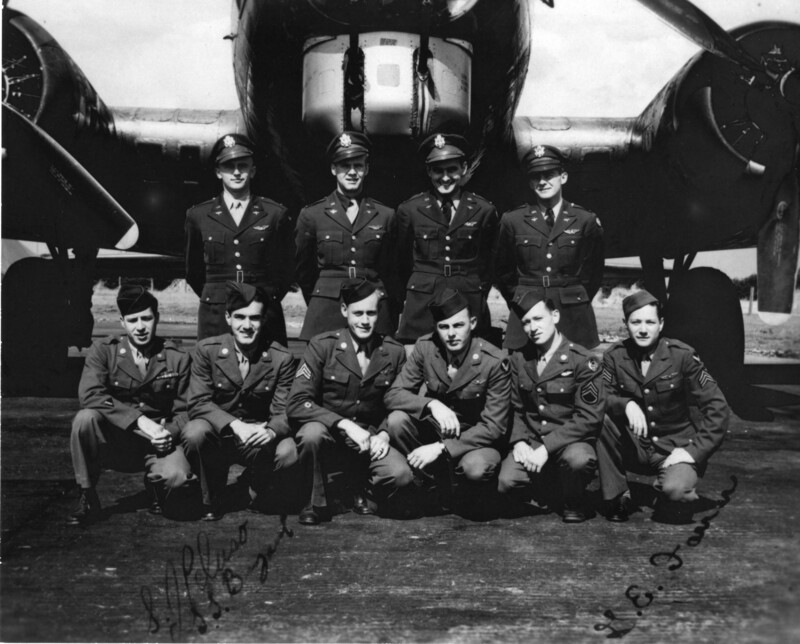 James was originally assigned to the Howard A. Jung crew of the 544th bomb group on July 26, 1944. 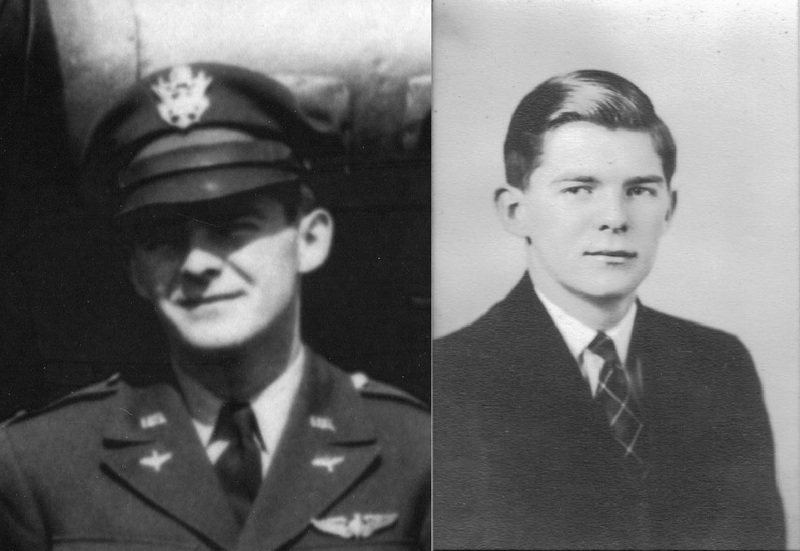 On August 3, 1944, Jung, co-pilot James Allan Vranna, navigator Thomas C. Bates, engineer/top turret gunner Harold L. Perry, and radio operator William Isaac Sellers – who was not a regular member of the Jung crew – were assigned to slow-time a new engine. On their way back to the base in the darkness, the evening fog settled in. The aircraft made several passes at the field with landing lights on at a very low altitude but could not see the ground. The aircraft could not be seen from the ground either, only the glow of his lights in the clouds. At 2330 hours, even though the crew was unable to locate the runway, Jung attempted to come in under the low ceiling, estimated at 300 feet. The aircraft struck the trees with a wing tip, tearing off several feet of the wing, crashed and exploded. Jung, Bates, Perry, and Sellars were killed in the crash. Vranna, the sole survivor, was seriously wounded (see note below). With the pilot dead and the co-pilot seriously wounded, the crew broke up. 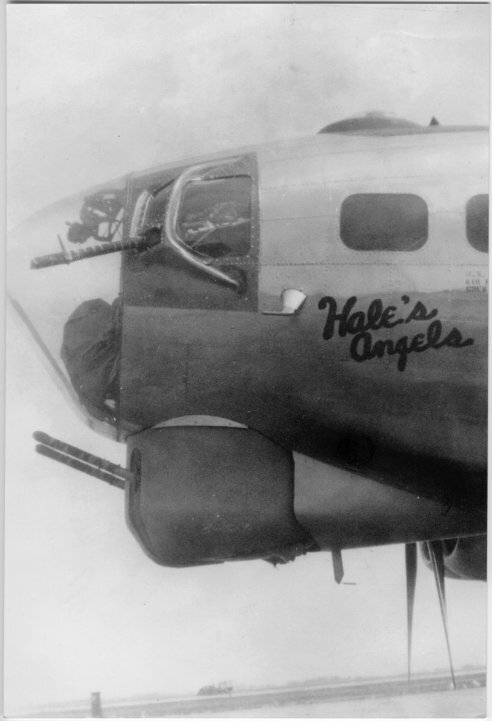 Ball turret gunner Harold J. Laursen became a member of the Richard H. Groff crew and completed thirty-three missions before finishing his tour and returning to the states. Radioman Herman J. Wolters flew three missions with the 384th before being transferred to the 36th bomb squad of the 801st bomb group. 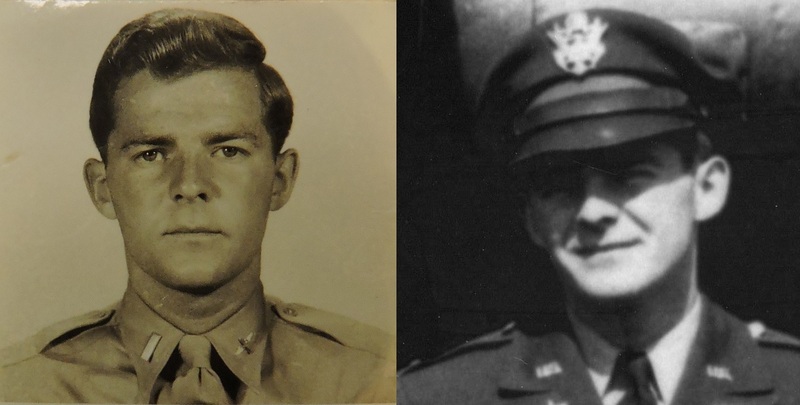 Flexible gunners Roland E. Creasy, William F. Peters, and James D. Walker, Jr.’s Army Air Forces careers are unknown. James B. Davis was the only other Jung crewmember to be reassigned to another 384th crew. James Davis was born on October 5, 1921 in New Castle, Indiana to Charles R. and Bess Millican Davis. During his 384th career, he earned three bronze stars, an air medal with five oak leaf clusters, and a presidential citation. He died on December 20, 2009 in Indianapolis, Indiana. According to his obituary on FindAGrave.com, James Allan Vranna “sustained multiple, devastating injuries which he bore with tremendous grace throughout his lifetime. He spent the next three years undergoing multiple surgical procedures and recovering from his injuries.” James Vranna died July 22, 2012 and is buried in the North Dakota Veteran’s Cemetery in Mandan, Morton County, North Dakota.